Remember my animal print post? I'd drawn little animals with a Steadtler permanent marker on a matte polish. Because I wanted to keep the matte finish, I didn't use topcoat over it. Still I wondered what would happen if I did. Well, turns out topcoat doesn't exactly work well with that marker, or does it? These pictures you're looking at are from my first attempt on the delicate print challenge. I used the same marker on top of Catrice New York and later added topcoat, causing it to smudge like crazy! If you look good, you can still see the letters. But, I actually really liked the smudged effect. It made the letters look a bit graffiti-like. Or like a quick and bad paint job, in a good way, heehee. That's what I love about experimenting: that it can lead you to things you'd never come up with otherwise. 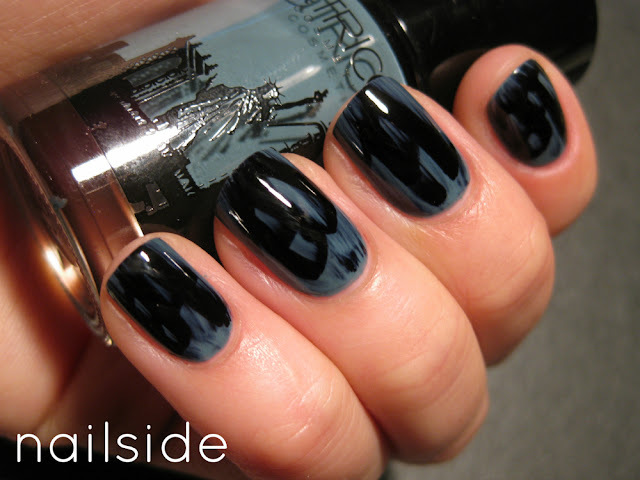 What do you think of this smudged mani? I think it's fantastic!!! But I'm afraid of using permanent marker on my nails! Maybe they stay black for a month or something! I think this looks awesome! Sort of like a washed, sandblasted, leaky graffiti. I would rename those "badass nails". O!M!G! I love it! 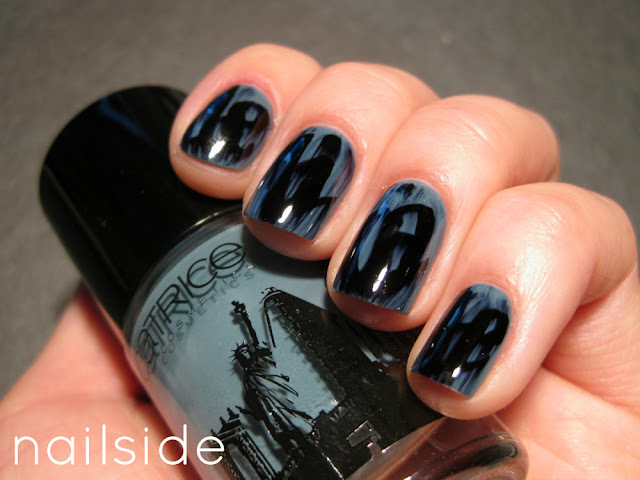 I have to try this, it looks so cool! Agreed, this is pretty neat because you can still make out the letters!! Oh, wow, i love it! Experimenting is pretty cool (when it goes right) but I agree with Gelic it looks amaaaaazing like you placed black feathers on the nails. It is amazing how much this changed even the base color! I will have to remember this if I am looking for a graffiti look. Wow, this looks very good!! How did you do that? . . . How do you do any of these? I like the smudged nails too. how did you do it? it's cool !! I like this effect very much. I am going to try it myself in the following days!